Bath and Body Works just released a new coupon: Save $10 on any purchase of $40 or more. This coupon is valid through January 3rd and should make all the post-holiday sales that much better! 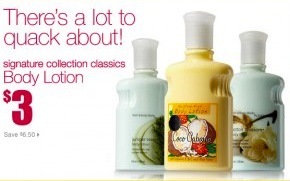 One of the sales that’s going on is the Signature Collection Body Lotions reduced to $3, down from $6.50. Bath and Body Works also has this coupon available through December 30th: Get a FREE Signature Collection Travel Size Item with any purchase (up to a $5 value). Remember, this coupon states any item, so look for an inexpensive product. Think clearance, a small hand sanitizer, nail file or any other product priced around $1-$2!